Choosing a paddle is very much a personal choice - you'll know when it feels right! To help you make this important decision, we offer a range of paddles from different manufacturers around the world. Remember that, as a family firm run by paddlers, we not only aim to give you service that is second to none, but our solid advice is based on years of paddling experience. We recommend that you try out different paddles before buying. Swap paddles with as many people as you can when you are out on the water - feel the differences between them. Also, come to our Ayrshire showroom and demo days to try out different paddles for yourself. 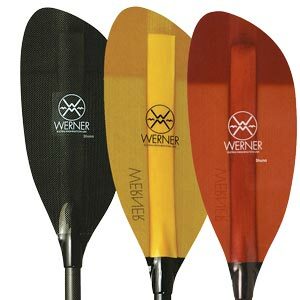 what size and shape of blade will suit your paddling style? would you benefit from a crank shaft or do you prefer a straight shaft?